18th Century English Porcelain. It is also discussed by Maurice Hillis in Liverpool Porcelain 1756-1804, where the previous attribution of the prints on this mug to Sadler and Green is questioned and the suggestion made that they were possibly printed at the Christian factory and that the date might even indicate the commencement of overglaze printing there. The haymaking design was popular over a long period. It was first used at Worcester, in a number of variations, where it is known as the Haymakers. The source of the Worcester versions is a vignette in a song by Dr Arne published in 1758. Different versions were subsequently printed at Liverpool. These have another source, being copied from a Robert Sayer print entitled Harvest Home. These versions are found on delftware tiles and creamware as well as on porcelain. The date of publication of the Sayer print is not known but John Sadler wrote to Josiah Wedgwood on the 27th March 1763 asking him to obtain a copy of the print. This undated Robert Sayer print of Harvest Home is signed "Grimm Invent." to the left and "June Sculp." to the right, for the engraver John June. This design, called Two Children Dancing, is known in different versions on delftware tiles and creamware, as well as on Christian's porcelain. It was previously called the Dancing Dwarfs. A cylindrical mug with a strap handle, printed in black and with the date "Feb. 9. 1768" painted in black enamel. It has two prints with the date in the centre, one print of two haymakers, the other of two children dancing and a man playing a flute with a woman standing behind. It was exhibited at the Stoke-on-Trent Museum and discussed by Geoffrey Godden in 18th Century English Porcelain. 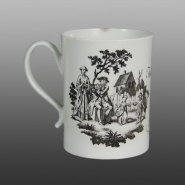 It is also discussed by Maurice Hillis in Liverpool Porcelain 1756-1804, where the previous attribution of the prints on this mug to Sadler and Green is questioned and the suggestion made that they were possibly printed at the Christian factory and that the date might even indicate the commencement of overglaze printing there.